Internet revolutionized our lifestyle. New generation devices like smartphones and tablets allow us to be always connected: the web represents a significant part of our days. These epochal changes bring with them questions about the potentialities and the risks of web 2.0. This chapter introduces a research whose purpose is to investigate the relationships between Online and Offline lives in Emerging Adulthood. Starting by the concept of functional organ (Leont'ev, 1972) and inverse instrumentality (Ekbia & Nardi, 2012), the goal of the study is to go beyond the research on web addiction, and start to explore a model able to predict why some emerging adults have their life empowered by the web and while others get trapped in the problematic use. The Internet is an important part of our daily lives and it represents a basic tool for information searching, social interactions, and the consequent knowledge construction (Frozzi & Mazzoni, 2011; Mazzoni & Zanazzi, 2014). The benefits that derive from the Internet to perform daily activities are enormous; information and communication have never been so easy to access and fast. However, there is one downside. Web 2.0 requires a lot of our attention during use (due to the network of relations and information processing on which we are absorbed) and it often distracts us from tasks in which we are involved in during daily activities, such as studying, working, or cultivating offline relationships. The integration between being online and offline is an important part of the psychology of human beings (Turkle, 2012). In some cases, it is possible to find a balance between these two aspects of human life. The web is functional to work, to study, and to carry out daily activities. In other cases, people run the risk of pursuing behaviors that lead to problematic use (Davis, 2001). Considering the previous positive and negative aspects of the Internet use, the theoretical perspective of this chapter is based on the assumption that the Internet is not good or bad: it could become problematic or empowering based on how it is used and depending on the reasons behind such a use (Mazzoni, Baiocco, Cannata & Dimas, 2016; Mazzoni, Cannata & Baiocco, 2016). This chapter relies on the theoretical framework that allows the researchers to take into account both the positive and negative outcomes of Web 2.0. Leontev’s (1972) proposed the construct of functional organ to describe an artificial tool that is integrated into the behavior and the cognition of a human being to become an extended part of his/her biology. On the other hand, Ekbia and Nardi (2012) explained that web technologies might enable situations of inverse instrumentality, a process of objectification of users that regulates their behavior in a non-expectant manner, drawing them in or pushing them away from certain kinds of activities. 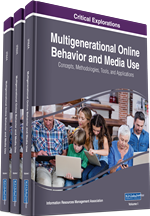 By means of a cross-sectional study, the objective of this chapter is to analyze which processes are related to a massive and pervasive use of the web to be a source of empowerment (functional organ) or a source of problematic use (inverse instrumentality) during emerging adulthood.